Following an industry trend and fulfilling a dream that many had for the longest time, comes the new IWC Big Pilot's watch in bronze. Maintaining the roots of the original model with the triangular index positioned below the minute chapter ring with Arabic numerals, the new IWC Big Pilot's watch in bronze features a black dial with vintage 'ecru' superluminova. With a bronze case measuring 46.2 mm in diameter and 15.8 mm in thickness, this iconic watch from IWC just got better, if that is even possible. Released in a limited edition of 1,500 pieces it will for sure fly off the shelves at the IWC Boutiques and authorized dealers. Supplied with an almost identical brown calfskin strap from Santoni that comes with the Pilot's Watch Spitfire in 18K red gold but with bronze grommets, the new bronze Pilot's watch is extremely vintage looking. 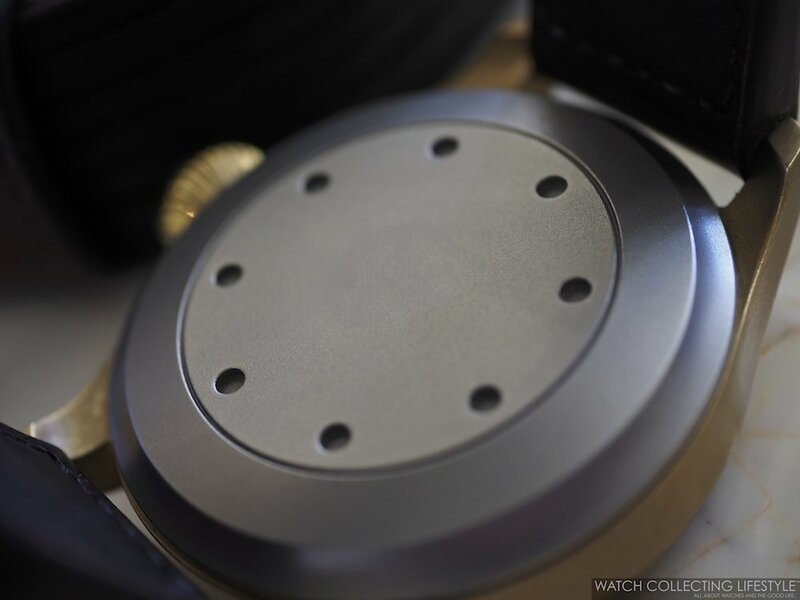 The 46.2 mm case is exceptionally finished with a satin-brushed finish all around including the bezel and it seems to be in the same type of bronze alloy that Panerai utilizes for their bronze cases —something that will ensure that the case develops some interesting patina over time. The dial with its vintage looking superluminova features the traditional 7-day power reserve indicator at 3 o'clock, the trapezoidal date aperture at 6 o'clock and this time blued hands to give it that extra pop. One thing we did notice on the prototype under review, is that the anti-reflective coating on the sapphire crystal seems to be more bluish than usual, hence the blue tones on our pictures. As far as the color of the dial, it is a true black. The ratcheted pilot's crown remains untouched in this new model with the 'Probus Scafusia' Latin phrase on it. The IWC Big Pilot's Watch Bronze limited edition is powered by the IWC manual wound in-house calibre 51111 with 42 jewels and which provides a power reserve of 7 days when fully wound while beating at a frequency of 21,600 vph. The movement is protected by a soft-iron inner case against magnetic fields and a solid hypoallergenic titanium case back that is bead-blast finished. As mentioned earlier, the new IWC Big Pilot's Watch Bronze limited edition is fitted with a rugged brown leather Santoni strap with bronze grommets. The strap features its iconic orange lining just like the Santoni shoes and matches perfectly the overall vintage look of this pilot's watch. To make the watch a little bit more interesting, the strap is equipped with a pin buckle in bronze instead of the more modern folding clasp. On the wrist, we were delighted to put the new IWC Big Pilot's Watch Bronze Limited Edition on. The watch wears slightly larger than its actual case size by a millimeter or so on a 7.25" wrist. The new IWC Big Pilot's Watch Bronze Limited Edition is simply a great looking watch that will for sure satisfy all watch lovers that indulge in bronze case watches. As far as weight, while we didn't put the watch on our scale, the watch feels nice and heavy and almost as heavy as the gold Pilot's Watch. Definitely a stunner and a watch that will for sure be a huge success. Available in a limited edition of 1,500 pieces. Sticker Price $13,200 USD. For more info on IWC click here.